I have two main goals with my makeup collection this year: use up my products, and spend less on new ones. This may seem simple, but for a makeup hoarder like myself, it definitely isn't. I think I did really well this month and I finished up both a lot of products and a lot of expensive products, so I am on track to reach my goal which I will talk more about after getting through all of these empties! I bought this over the summer in my first Lush haul. The description--berries and bergamot--sounded like something I would love, but I really disliked this scent. It lathers nicely and is a pretty, bright pink color, but I had to mix it with other body washes because I hated the scent so much. I definitely wouldn't repurchase this, but I have already bought other Shower Creams from Lush that I like so much more! Replaced with the Lush Shower Cream in Bubbly. I'm still on the hunt for a great cruelty-free shampoo and conditioner. This one wasn't bad, but I went through it really quickly. I would prefer something that lasts longer. I replaced it with a larger product from Not Your Mother's, the Coconut Milk and African Marula Tree Oil shampoo. So far I prefer the Beach Babe shampoo! Again, I didn't mind this conditioner but I don't think it did anything great for my hair. It lasted longer than the Not Your Mother's shampoo, but I didn't want to repurchase it because it's so expensive and didn't work well for me. 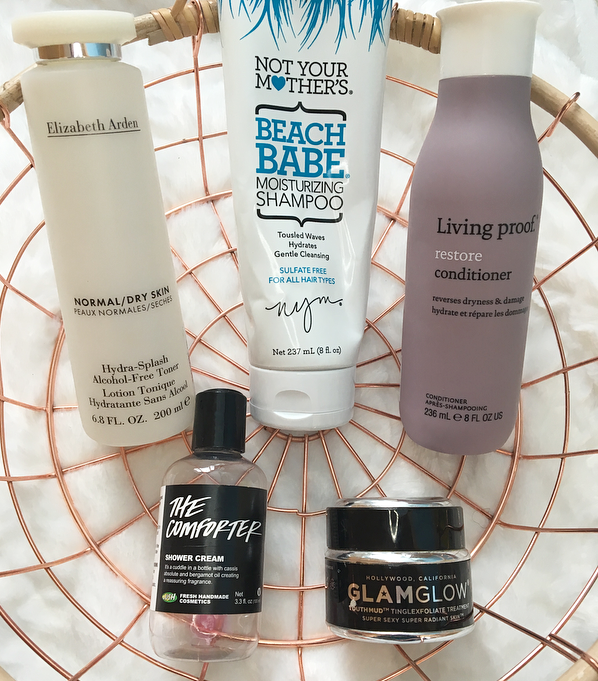 I am considering trying another Living Proof conditioner, but for now I replaced it with the Not Your Mother's Coconut Milk and African Marula Tree Oil conditioner! I couldn't find this anywhere online, but I purchased it from TJ Maxx for $7.99. I liked it while I used it, it didn't leave my skin feeling dried out, but I wanted to try some other toners that I bought recently so I replaced it with a sample of the Mario Badescu Glycolic Acid toner. I don't think that this mask was $69 dollars when I purchased it, but that is the retail value of it! I've had it for at least a year and just recently started using it again. It had dried up, but a bit of water revived it. The mask is a clay one that has all sorts of little chunks of leaves in it. It's quite strange. I liked that you could see the oil being pulled out of your pores on your nose, but it dried my skin out and is not worth the money in my opinion. I wouldn't repurchase even if Glamglow was cruelty-free. I have a bunch of these samples lying around and this is the first one that I finished! I like to mix it into a matte foundation for a healthy glow, but you can also use it as a very subtle cream highlight or a primer before your makeup. At one point in time, I'm sure this was a unique product, but now I don't feel like I need it as there are so many liquid highlighters on the market. 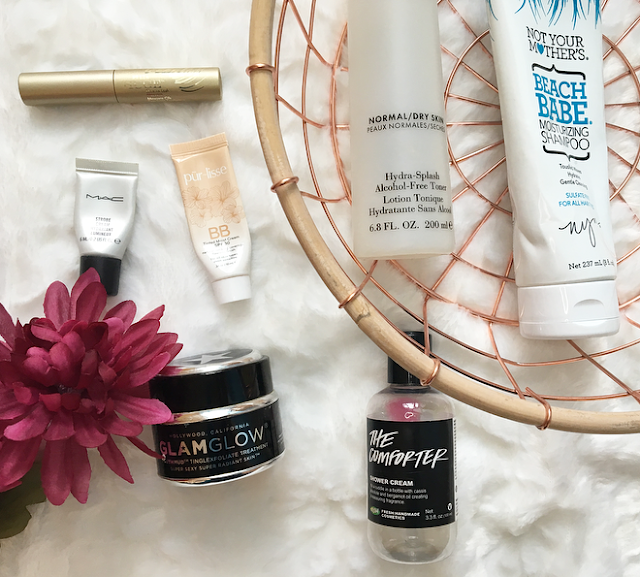 Ipsy sent me this in a bag several months ago and I fell in love with this BB Cream! It matches me really well and has surprisingly good coverage. I love how healthy it makes my skin look. I'm considering purchasing the full size, although I might go for another travel size so that I can take it to Mexico with me. I've gone through a few samples of this and I remember loving it the first time, but with this sample it dried out really quickly and started to get clumpy on my lashes. It has the hourglass shape that I love in a mascara, but I don't think I'll repurchase this at the moment. Does anyone else remember these roll-on lip gloss applicators? I loved them when I was little! When I saw it standing in line at Victoria's Secret I had to try one. I liked the lip oil at first, it felt very light and had a vanilla scent, but it's gotten hard to use now. Not a lot of product comes out so I decided to toss it. I have fond memories of this lip gloss, too. My aunt used to get me these every year for Christmas. I find them moisturizing and they always smell great, but this one has gotten too old for me to use. I couldn't find this exact scent online but Bath and Body still carries some lip glosses, so I linked those instead! Honestly, I can go months and months using the same loofah and not think twice about it. They never seem to rip on me or stretch out. I got a new loofah for Christmas and figured it was time to replace my old one! 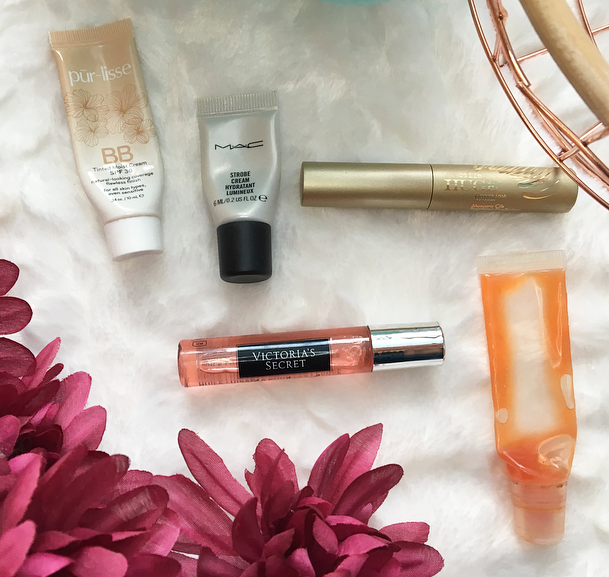 If you didn't read my last empties post, I've decided to set a goal for myself: to use up a certain dollar amount of makeup by the end of 2018. In my last post I set a goal of $500, but based on this month's useage, I think I might be able to double that by the end of the year. So my new goal is to use up $1000 worth of product in my empties! Another goal is to spend less on makeup than what I'm able to use up each month. Once I finished the Glamglow mask, I knew I had at least $50 to spend this month so I had one little Ulta haul, but other than that I am well within my goal, meaning I spent less than $159 on makeup this month. Truthfully, I'm saving up my money so that I can buy the Nabla Dreamy palette when it comes back in stock...but it sure is good for this project and for my bank balance! 13 comments on "January Empties | Finish $1000 in 2018"
I have so many products I want to finish this year, mostly skincare. I have the bad habit of opening many similar items (eg. serums) and I can't get through them quickly. Same here. I have so many products and I try to finish them and spend less for new products. :-) Have a geat week. These products all look amazing!! You did really good with the empties. I still haven't tried the Mac Strobe Cream but I would like to give it a try.